Today I finished this little Lady Bug Cupcake painting and listed it on eBay. My daughter, Amber gave me gifts for Mother's Day with a 50's kitchen theme. 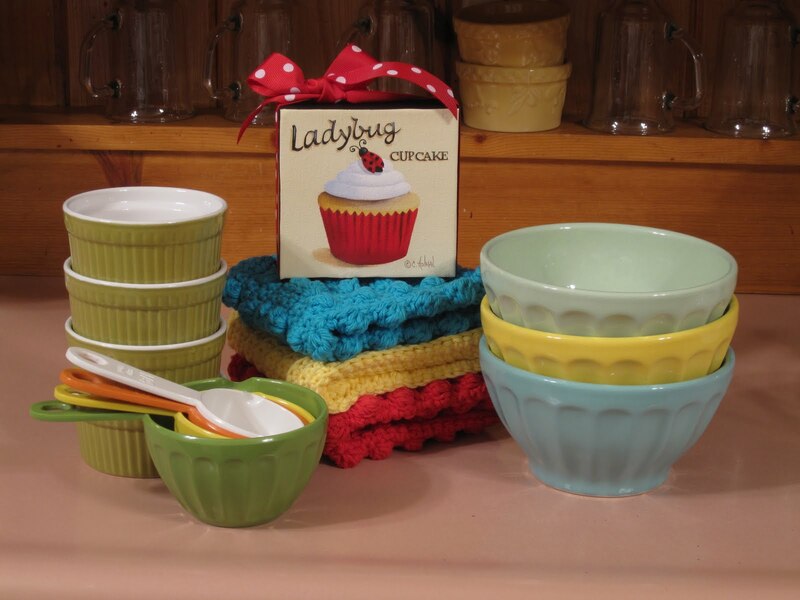 She made the brightly colored dish cloths to work in the new design for my kitchen. The ramekins and the little retro measuring cups were the finishing touch to her theme. I got the little bowls when my daughter and I went to Anthropology this weekend. I wanted a red one too, but the only red bowl they had left was chipped. A ladybug proudly sits on top of this delicious yellow cupcake piped with creamy white frosting. Red and white dotted grosgrain ribbon is wrapped around the edges of the canvas and tied in a perky bow on top. Cathie for some reason ladybugs always make me smile! I was strawberry picking this weekend and I saw quite a few ladybugs on the plants. 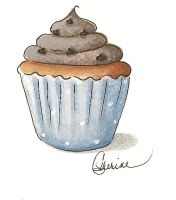 This cupcake made me smile too! Will you be making this into a print? 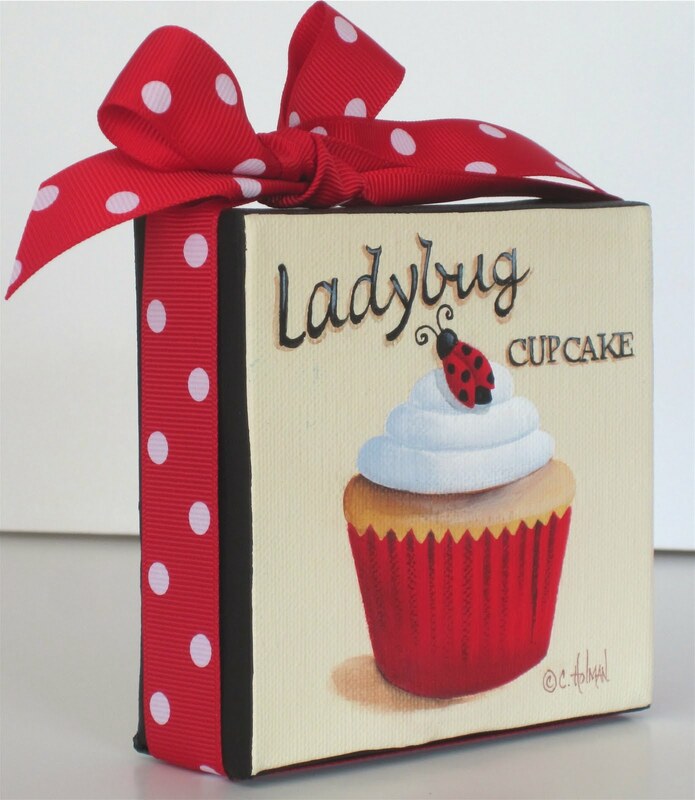 What nice colors for your kitchen and the bright red cupcake paper on the ladybug cupcake would work with so many kitchens, including your own. Lovely Mother's Day, thank you. I can see that yours was, too. 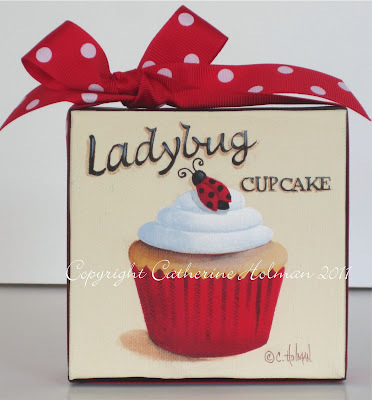 Catherine, I love your ladybug cupcake...your bug is so whimsical and perfect.